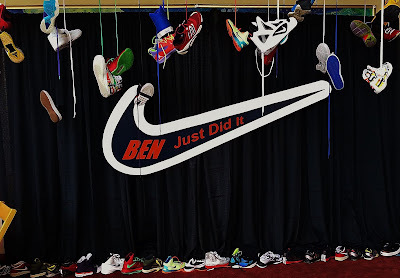 is the logo that we created and placed on the dance floor. 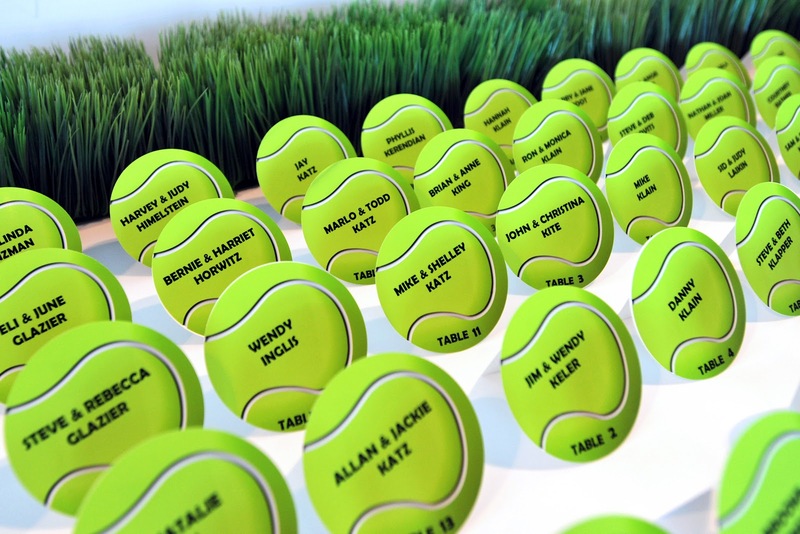 Placecards were tennis balls with guests names and table numbers. 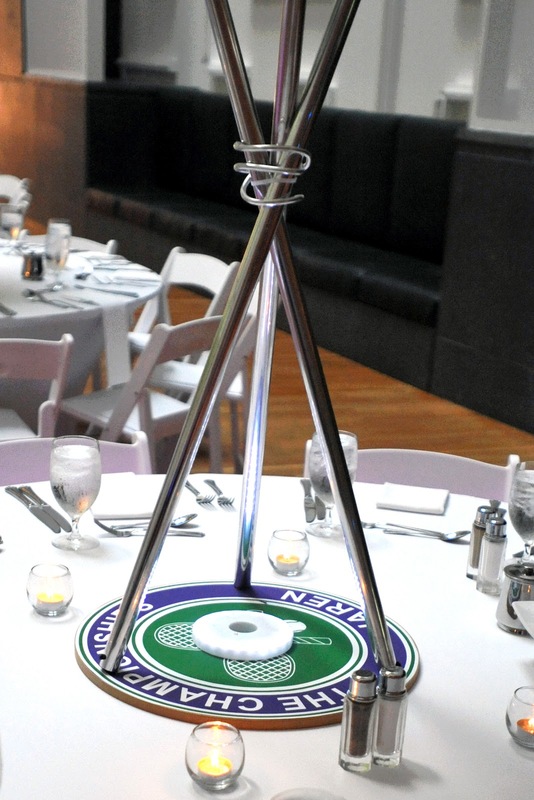 perched atop silver stands with Jaren’t logo at the base. 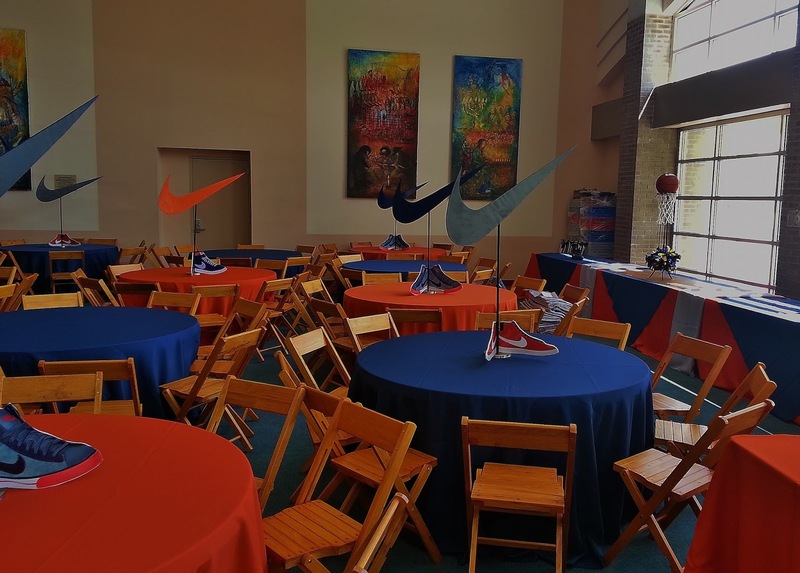 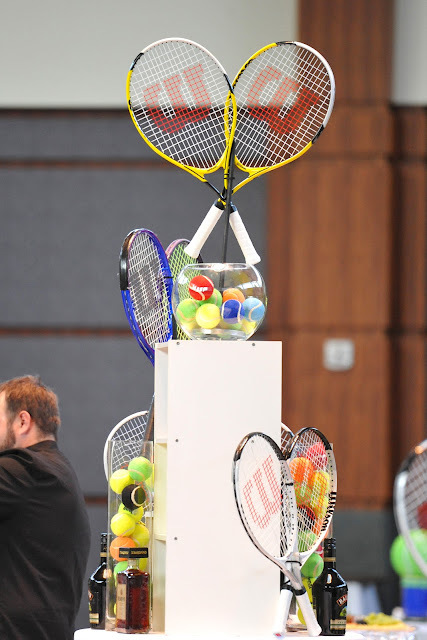 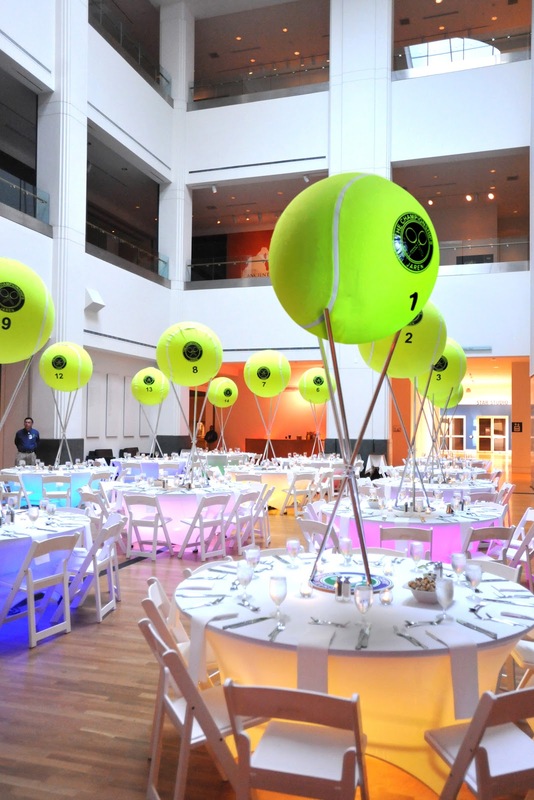 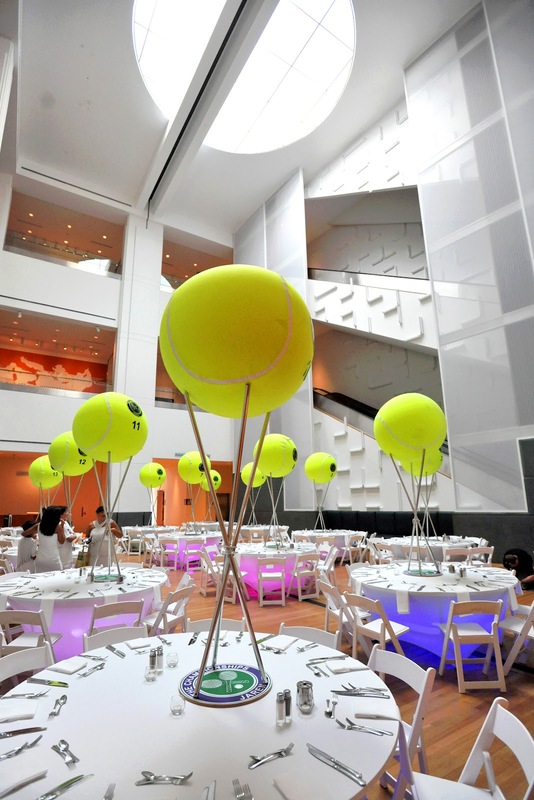 We put the logo on the giant tennis balls as well as the table numbers. 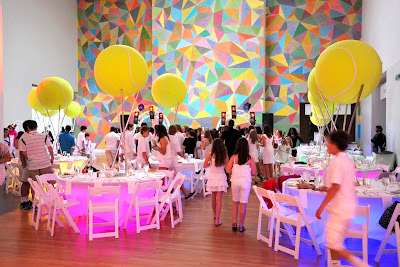 Check out this hand painted permanent wall art backdrop for the DJ and dancing. It looked amazing with the colored tables. If you look closely you will see that all the guests wore their Wimbledon Whites for the party. 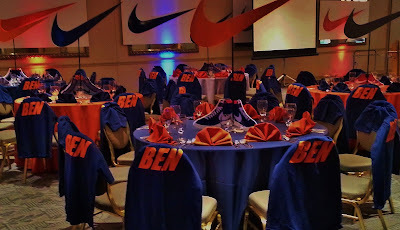 It was great because the guests then became a cool part of the overall look. 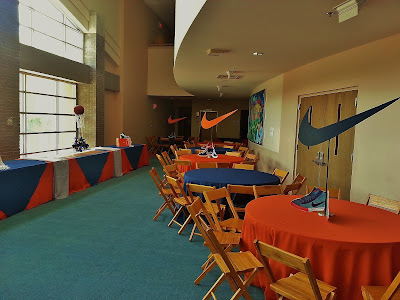 Here’s a shot of one of the bars that evening. 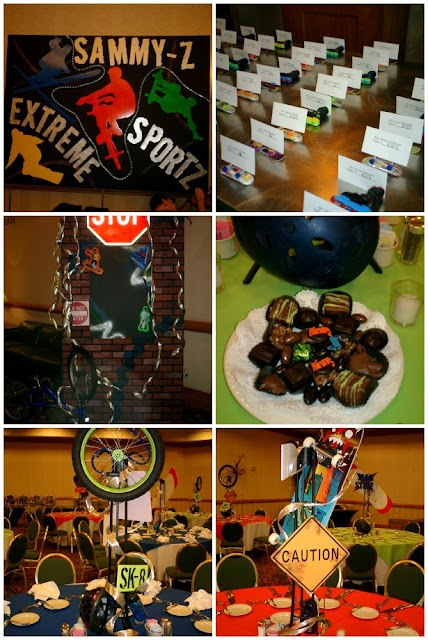 Thank you Sue Huffer, with Sue Huffer Photography for all of the beautiful photos. 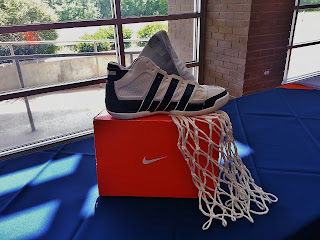 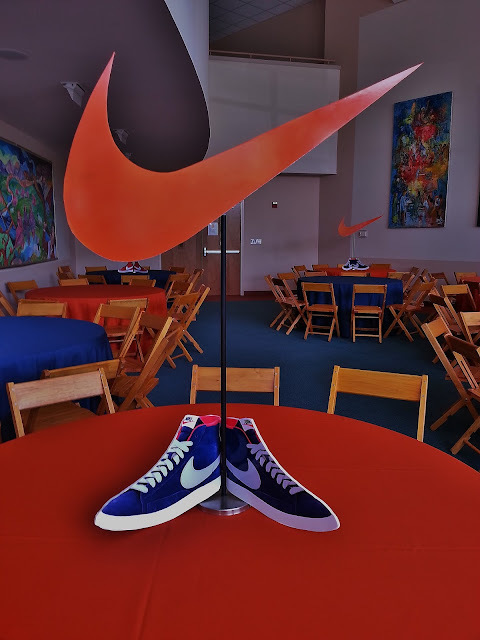 This entry was posted in Bar Mitzvah Party, Bat Mitzvah Party, Sports Party, Tennis Party, wimbledon party on June 22, 2012 by Setting the Mood. That’s right…our Colts are in the playoffs again. 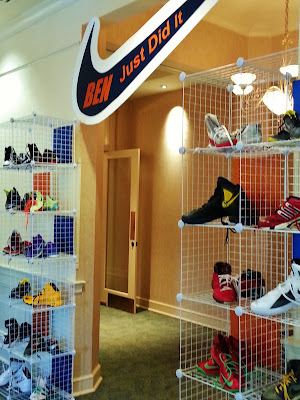 A Classic Party Rental asked us to decorate their showroom for a Colts Playoff Party. Here is a sneak peek of one of the tables. 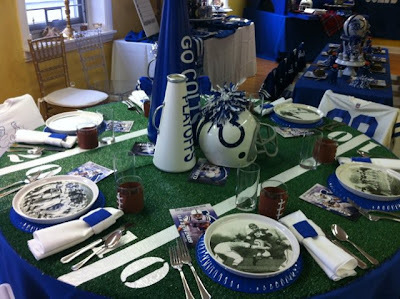 This entry was posted in Colts Playoff Party, Football Party, Sports Party, Tailgate Party on January 6, 2011 by Setting the Mood. 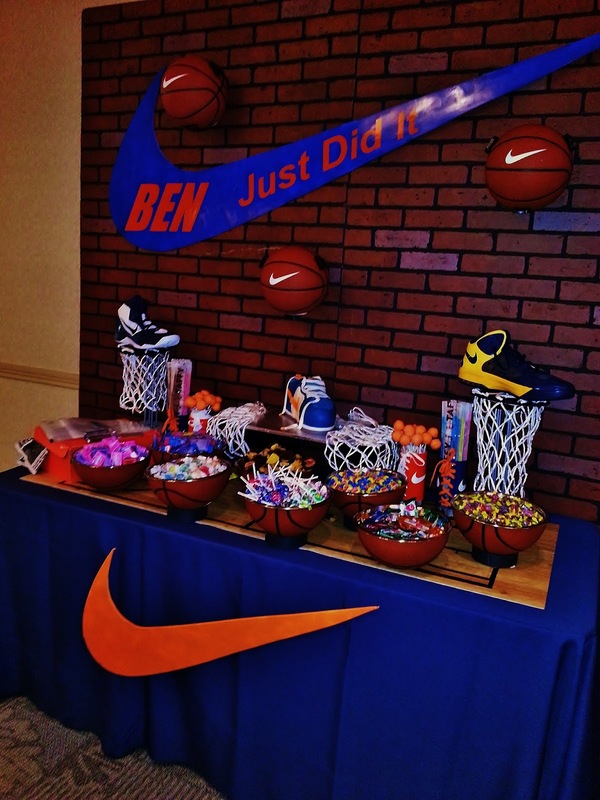 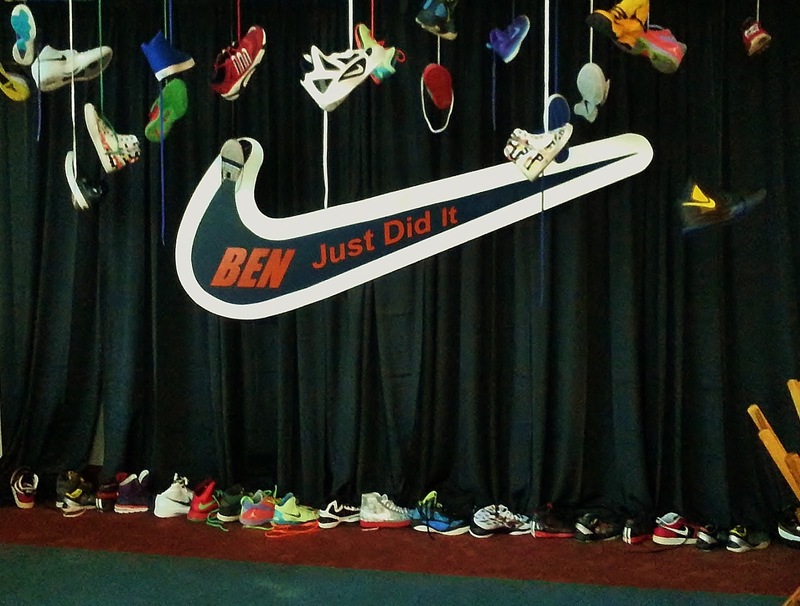 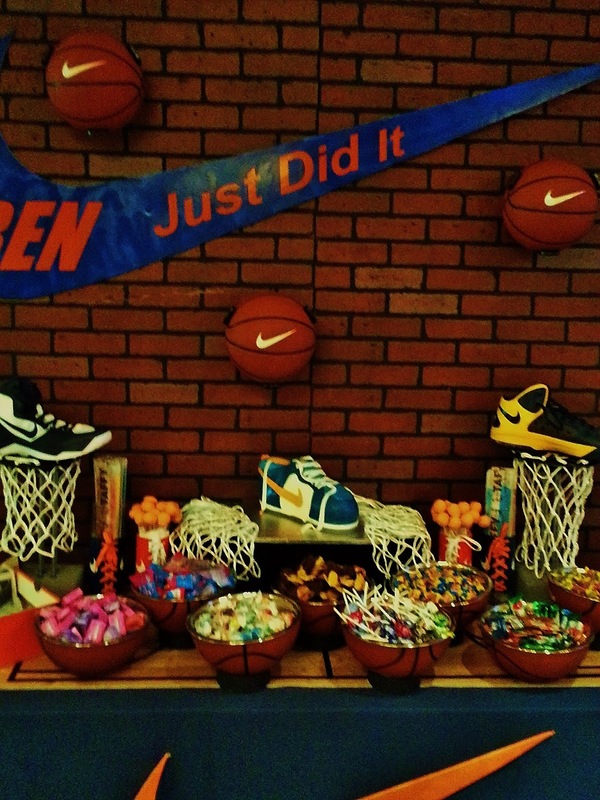 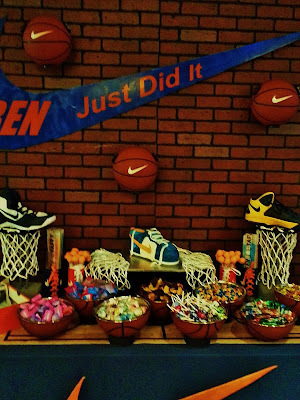 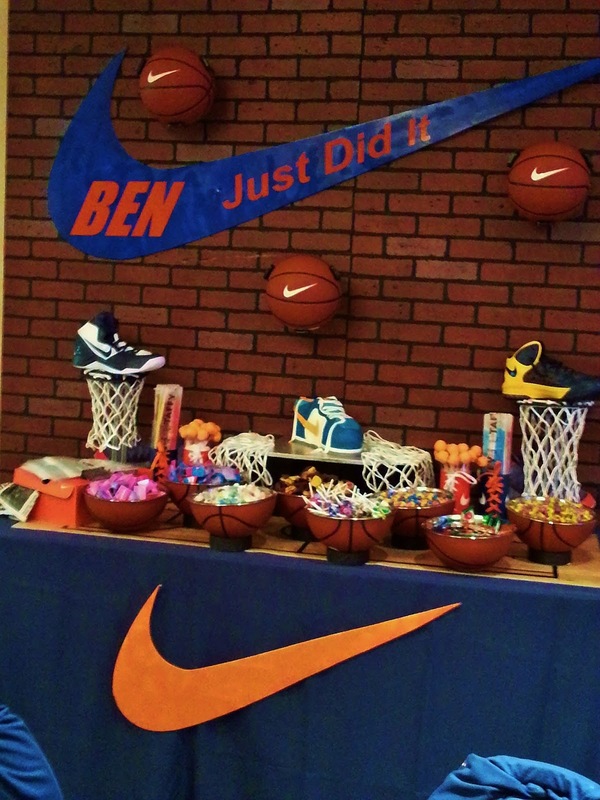 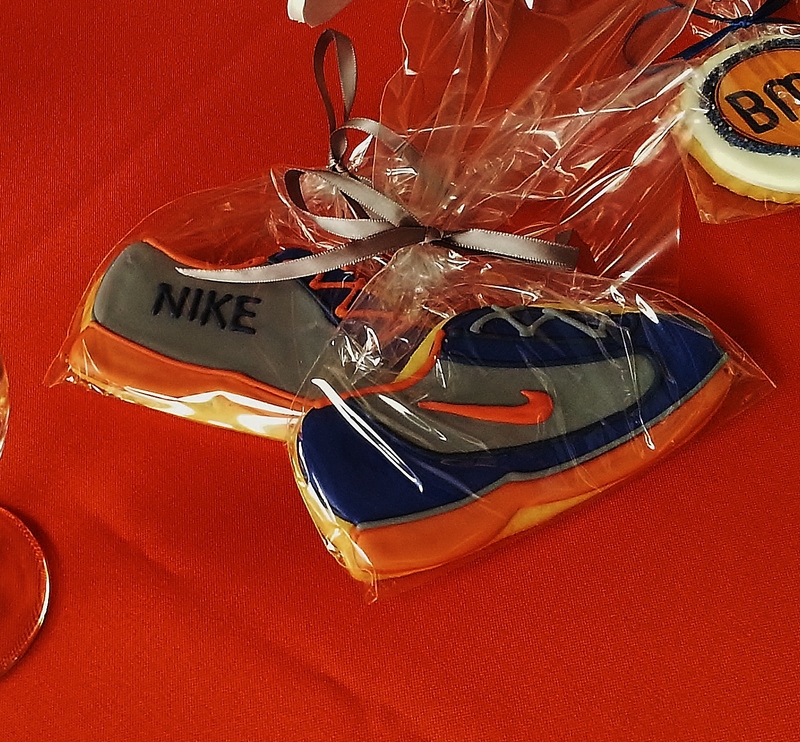 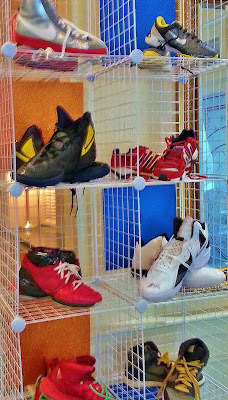 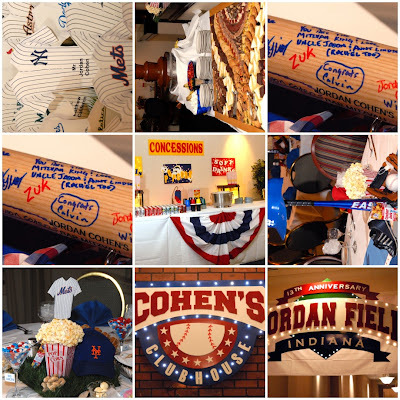 Our Bar Mitzvah party this weekend was all about Indiana…sports that is. 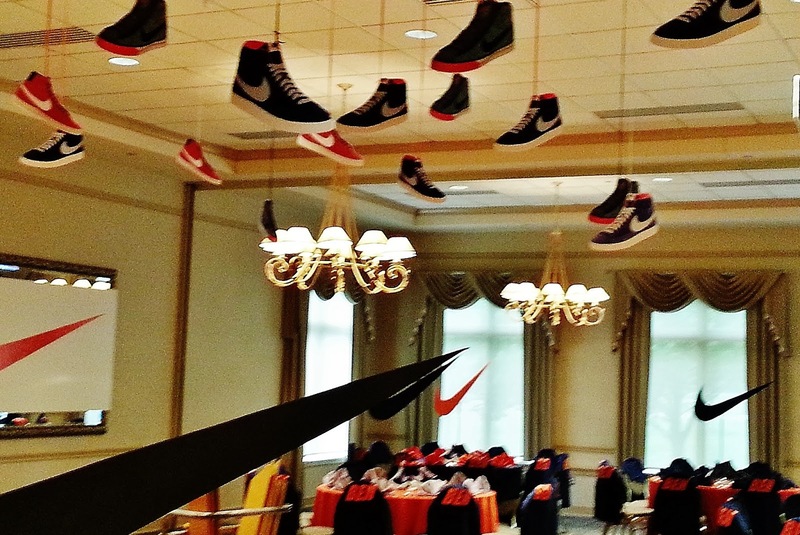 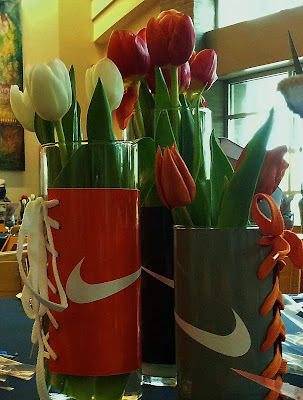 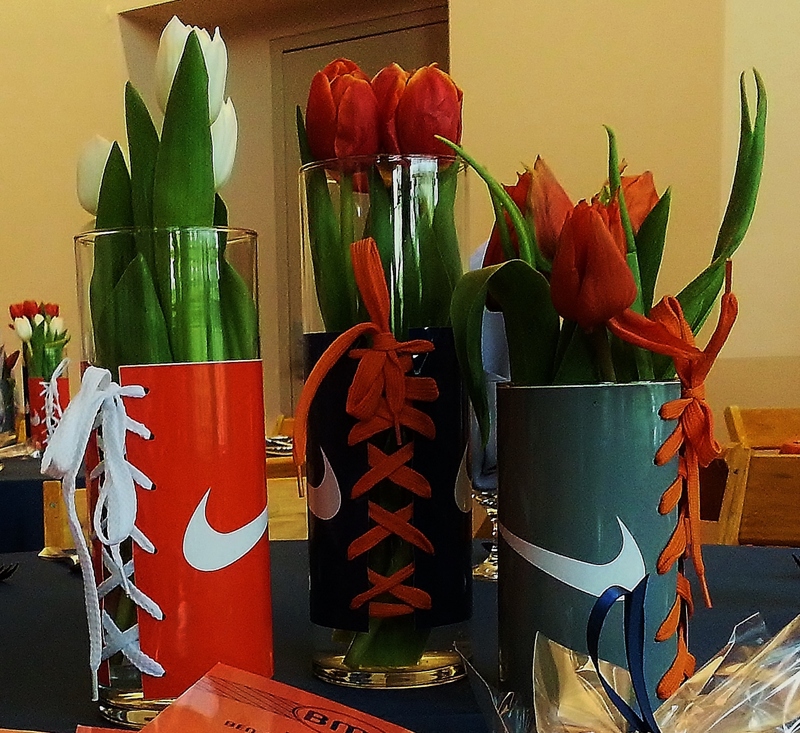 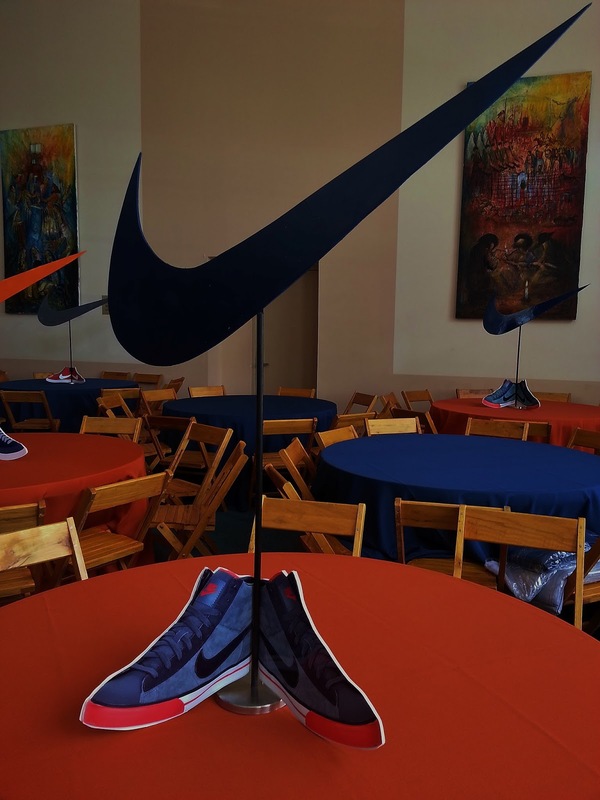 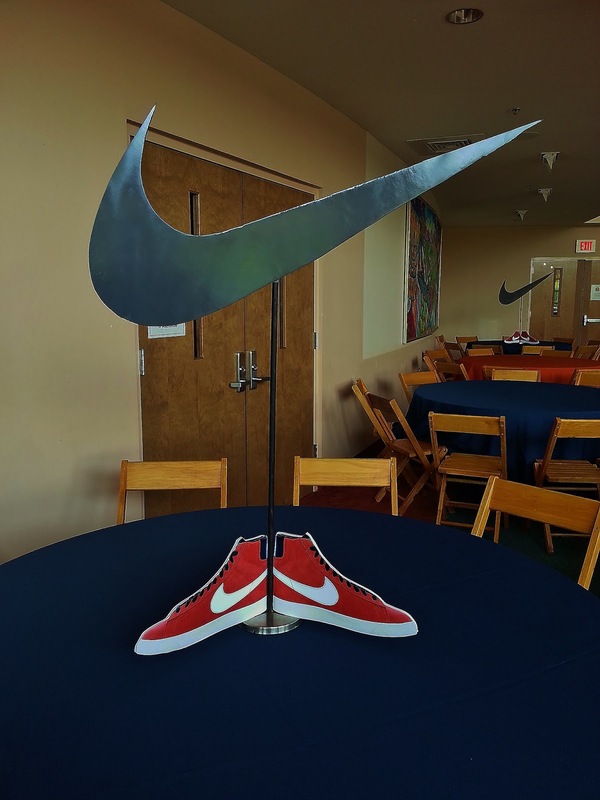 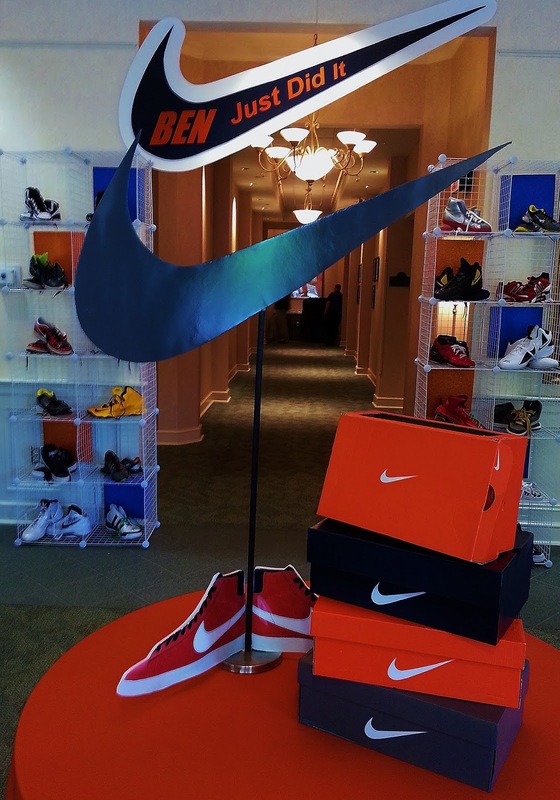 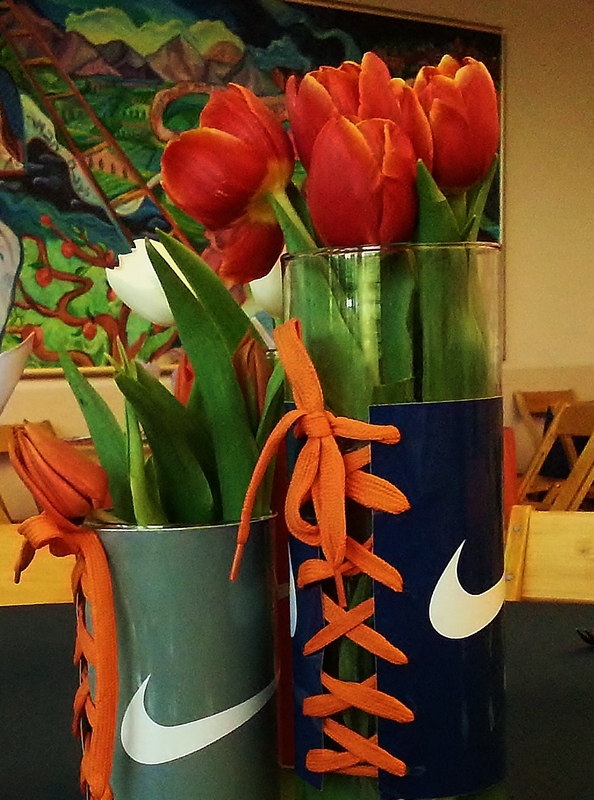 We created centerpieces to showcase all of the local college and pro teams here in Indiana. The placecards were trading cards with the Bar Mitzvah boy dressed up in all of the local teams garb. 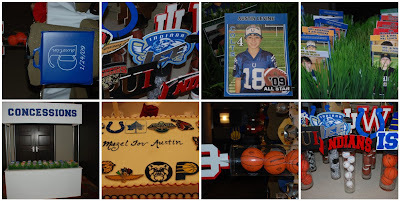 The kids sign in board was a Colts jersey and IU jersey. 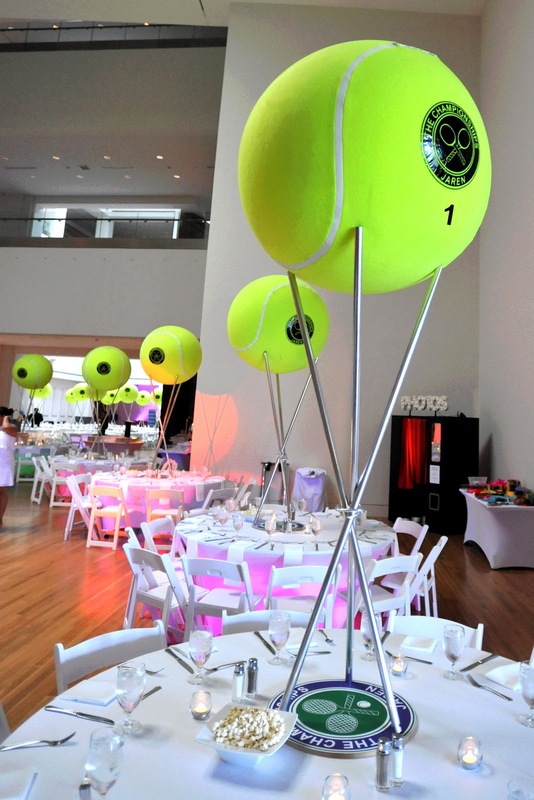 The guests favors were stadium seat cushions strapped to the backs of each chair. 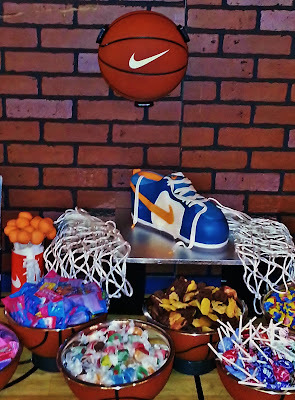 This entry was posted in Indiana Sports party, Indiana Theme Party, Sports Party on January 26, 2009 by Setting the Mood. 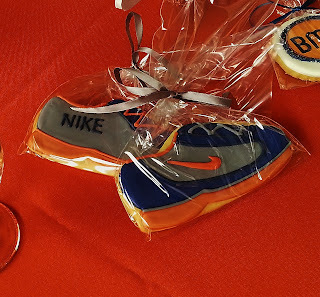 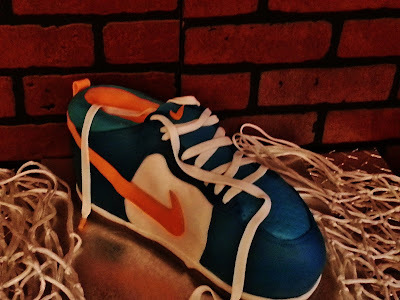 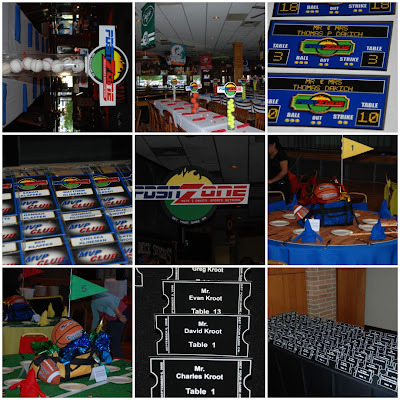 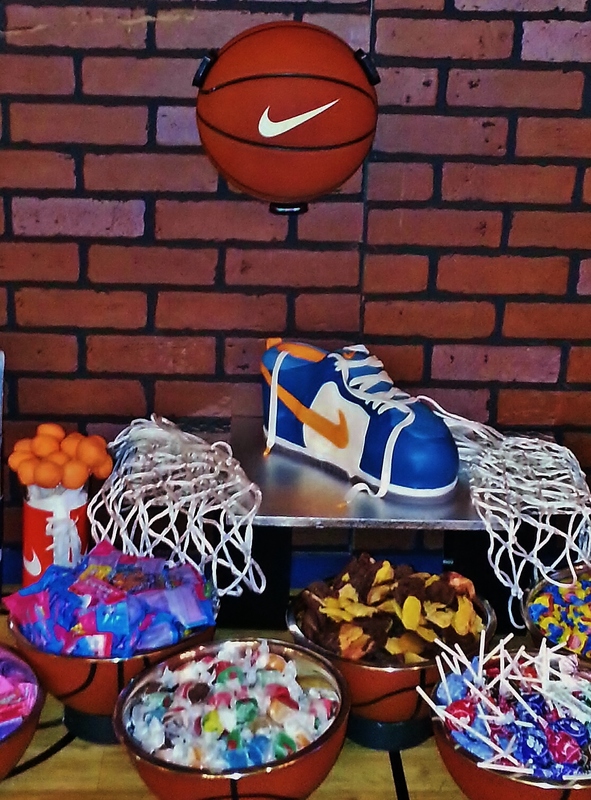 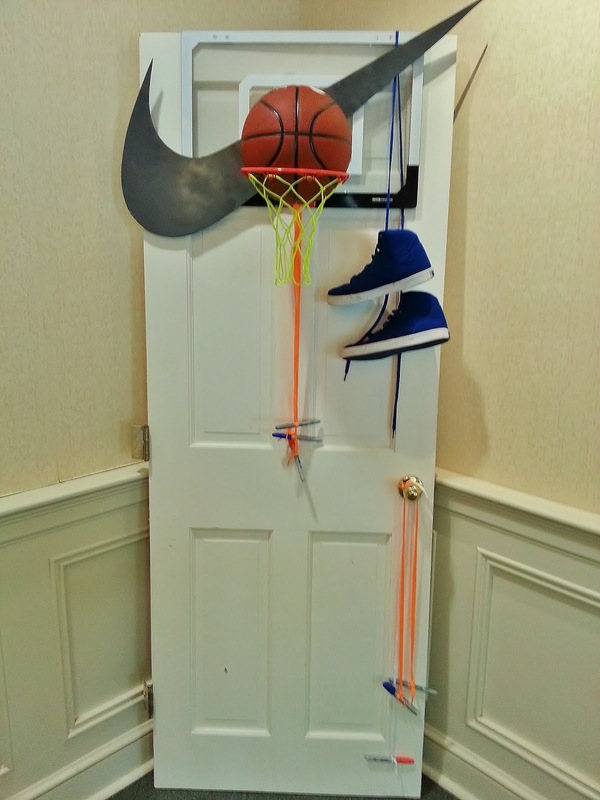 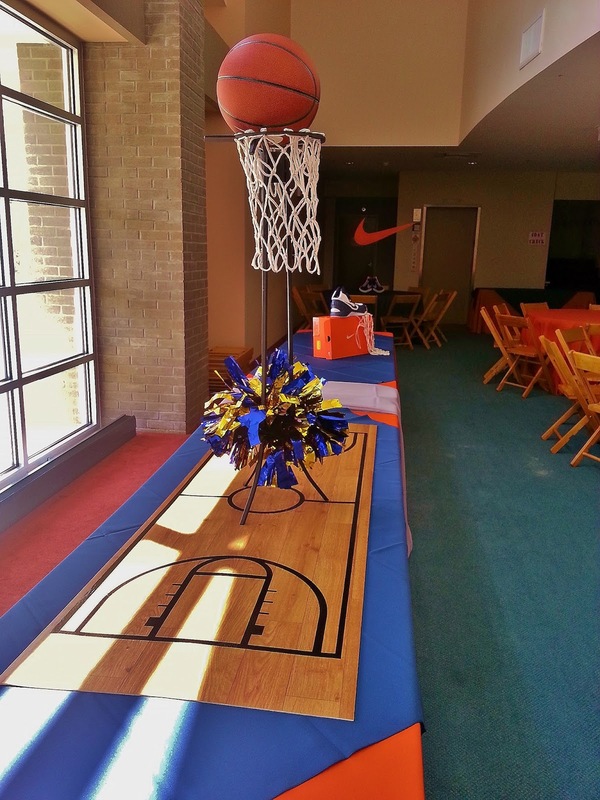 Here are some photos from a sports theme party we created for two best friends. This entry was posted in ESPN party, sports bar mitzvah, Sports Party on September 20, 2008 by Setting the Mood.